A great way to cool off in the Palmetto State is to go coastal and take a splash at one the beautiful beaches of South Carolina State Parks. You have four to choose from: Edisto Beach, Huntington Beach, Myrtle Beach and Hunting Island state parks. These scenic coastal parks offer an ocean of summertime fun. Come on and dive into the excitement! 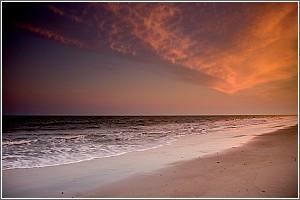 Only one hour from Charleston, SC, Edisto Island is home to Edisto Beach State Park. Palmetto trees line the pristine beach-front park which also features a maritime forest and an educational center full of fun interactive exhibits that highlight the natural history of Edisto Island and the surrounding ACE Basin. Spend time surf fishing South Carolina shores or reeling in flounder or whiting from the salt marsh. Visitors can also hike the four-mile nature trail that winds through the maritime forest with beautiful vistas overlooking the salt marsh. The park’s oceanfront campground makes for a perfect stay on Edisto Island. The park also features another campground and cabins located in the maritime forest. For many South Carolina park-goers Myrtle Beach State Park is the first state park they’ve visited, mainly because it was the first one to open to the public. Located along the Grand Strand, this 312-acre park has cabins just 200 yards from the beach. Comb the beach for seashells, fire up the grill near one of the picnic shelters or fish from the Myrtle Beach Pier. Stop by the nature center to learn about the variety of sea life that lives in the ocean. Another Grand Strand state park, located in Murrells Inlet, is Huntington Beach State Park. One of the main attractions at Huntington is Atalaya, a Moorish-style winter home of sculptor and philanthropist Anna Hyatt and Archer Huntington. The park is adjacent to Brookgreen Gardens. Wildlife abounds at Huntington Beach State Park. You’re likely to see an alligator basking in the sun, loggerhead sea turtles making their way to or from the beach or a variety of bird species, such as egrets and herons, wading in the water. You can be one of more than a million visitors who will come to Hunting Island State Park each year. It’s truly a hot spot to cool off. The park has five miles of beach, a saltwater lagoon and maritime forests. A lighthouse dating from the 1870s stands 170-feet tall on the park. Climb to the top to see beautiful views of the Atlantic Ocean and Lowcountry marshland. It’s worth the effort. Of all the lighthouses in South Carolina, it’s the only one that’s open to the public.